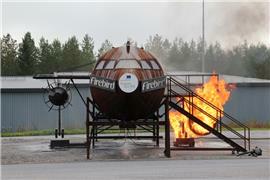 The aircraft extinguishing simulator can be used to practice emergency and rescue operations in air-traffic accidents. Our target groups are specifically airport rescue staff as well as emergency and rescue departments, but we also utilise the simulator in trainings of other client groups. Different types of aircraft accidents, such as landing gear fires, engines fires, cabin fires and cargo room fires. The use of different hose deployment methods in rescue operations of aircraft accidents: cannon, work line and basic deployment. Standard operational procedures for rescue operations of aircrafts that are inside and outside cannon range. Command of rescue operations at aircraft accidents with rescue authorities. The aircraft simulator is a steel structured training device. The simulator includes seats for 64 passengers; these are used to model a passenger plane’s cabin. Pressurised fuel is used to start modelled fires. The force of the fire can be adjusted with a remote control. Artificial smoke, which is produced with a smoke machine, is used in the plane’s cabin. The simulator has a total of 4 burn points, which are located at both landing gear points and in the engines. One of the plane’s engines is a turboprop engine and the other a turbo fan engine. During air traffic rescue operation training, we also address accident scenarios that are unrelated to airplanes. Other instruction services tailored for our clients include emergency and rescue operation instruction for fires in large spaced buildings and for chemical accidents.